We have a state of art infrastructure facility that is spread across a wide area of 7500 square feet. 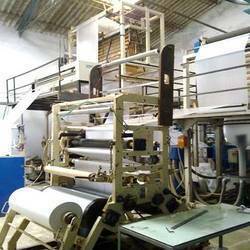 This unit is equipped with sophisticated machinery and products are made as per the latest technologies. We have a team of experts to maintain this unit. These experts use premium quality raw materials to manufacture these products. They are made as per the specifications of the clients. Our Area is spreaded across the area of 7500 sq. ft. We have well equipped with hi-tech machines. Our production capacity is 50 ton per month. We have with us a capacious warehousing unit which effectively store our entire range of LDPE, HM/HDPE Rolls & Bags. & Well equipped with all the requisite facilities, this unit enable our products to be stored in an appropriate, safe and secure manner. In order to ensure easy storage and retrieval of the products, we have divided the warehousing unit into different departments as per the category name of the products. Further, the entire unit is taken care of by our skilled warehousing personnel who make sure that all the products are free from pests and rodents. In addition to this, we also have an advanced packaging unit which is manned by our packaging experts. These professionals make use of high quality plastic and corrugated boxes to pack our entire range of products, thereby ensuring safe transit.